Today, while we are busy in the kitchen with mochi and nishime for New Year's Day, we have a Guest Blogger! Being my first Christmas away from the Spearrin ranch in Florida, the Fujimotos happily welcomed a few Spearrin-family Christmas traditions to help make me feel at home. A pillar of the Spearrin-family Christmas is a brunch on Christmas morning, where family members each bring a signature dish. 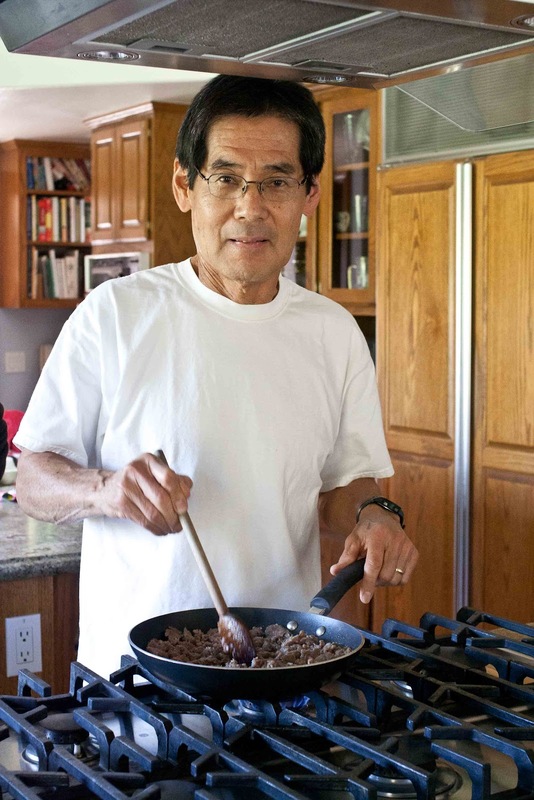 My signature dish is the Make-Ahead Breakfast Casserole, so this year I made it at the Fujimotos on Christmas eve, as the name suggests, and we cooked it on Christmas morning. Make-Ahead Breakfast Casserole takes about 30-40 minutes to prepare, but less time if you have helpers. Gary and Karolyn helped me so the prep was only about 20 minutes. 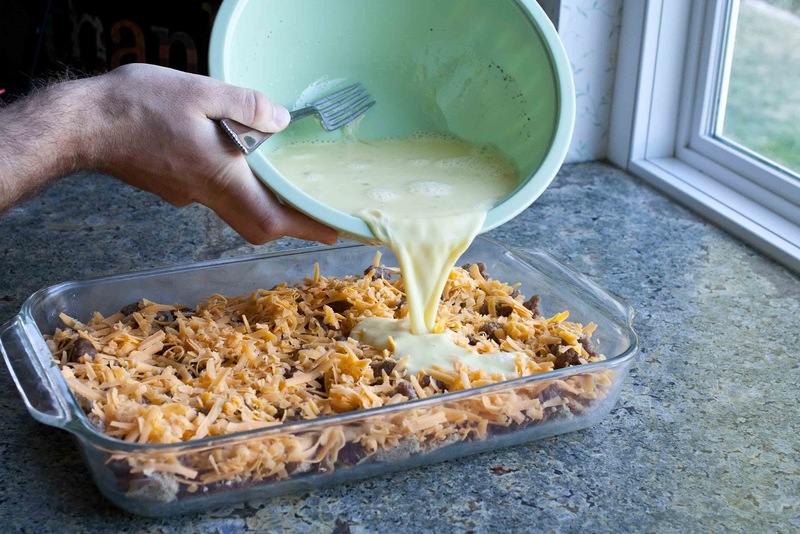 Start by lightly greasing a casserole dish (9" x 13" is ideal) with Crisco or butter. 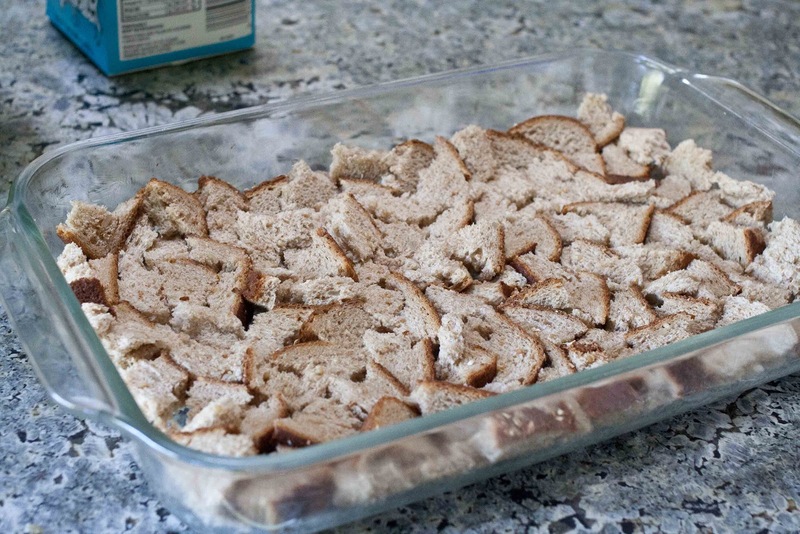 Then cube the bread and spread it evenly in the bottom of the dish. Pan-fry the sausage to a nice brown. The sausage can be slightly under-cooked since it will cook again in the oven. Gary handled this step. 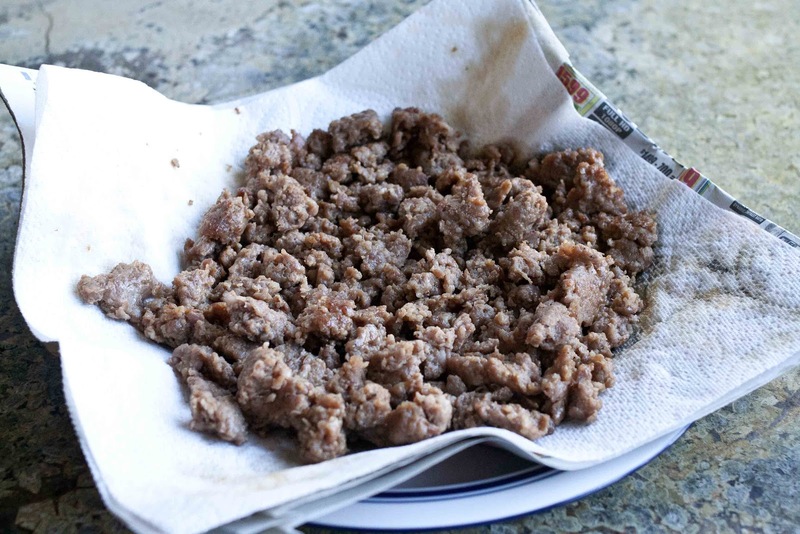 Drain the fat from the sausage and then empty the pan onto a plate with a few paper-towels. The paper-towels will soak up more of the grease. 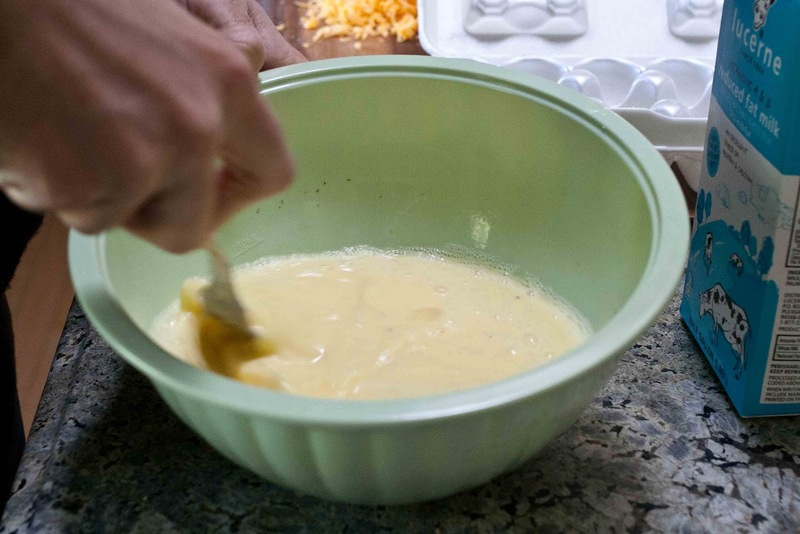 Add the eggs, milk, and dry mustard to a mixing bowl. Beat/whisk well like scrambled eggs. Now everything is ready to be combined. It goes quickly from here. 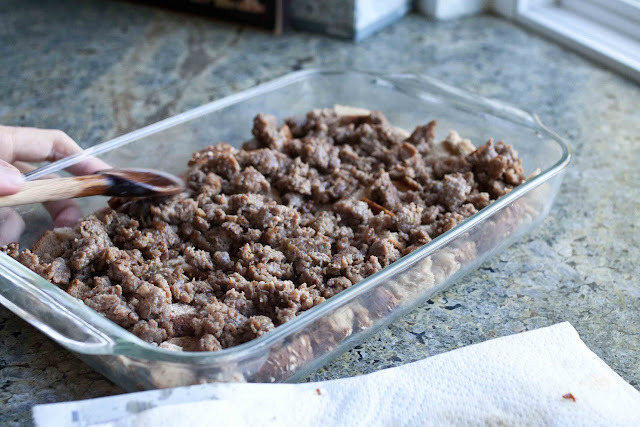 Take the crumbled sausage and spread evenly over the bread in the casserole dish. Sprinkle the cheese over the sausage. I like to go heavy on the cheese, maybe an extra 1/4 cup. Now just pour the egg mix evenly over the cheese and sausage. Cover the dish with plastic wrap or a lid and place in the fridge overnight. 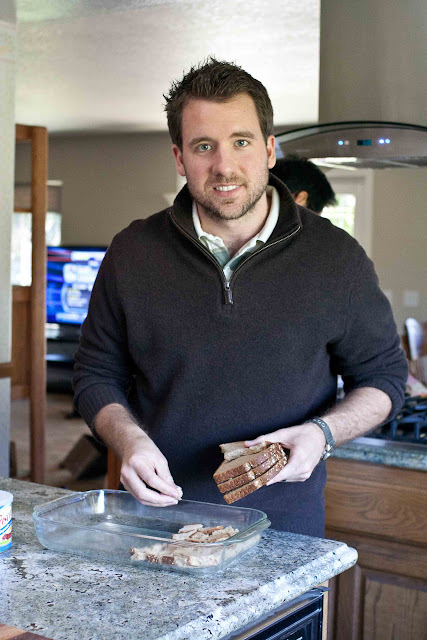 When you're ready to eat, place in the oven for 45 minutes at 350 degrees. Karolyn seems to think that every recipe/dish comes with a story, and this is no exception. I can't take credit for the breakfast casserole recipe. It comes from one of my favorite grade-school teachers, Mary Jane Cushman. 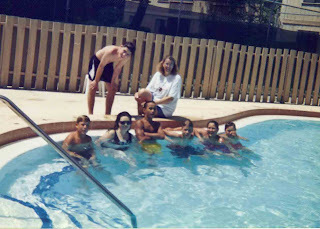 She's in the red shirt below with a few of my 7th grade classmates (Justin, Joey, Tres, and Laura). She taught my social studies/history classes from 6th-12th grade. 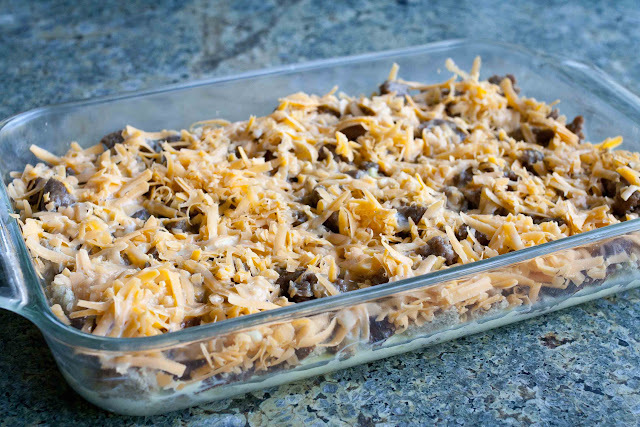 In middle school, I always had Mrs. Cushman for 1st period, so on the last day of classes before Christmas break, she would bring in a breakfast for the students, and this dish way my favorite. I asked Mrs. Cushman for the recipe after I left middle school and started making it for my family Christmas morning, so I guess that means I've been making it about 12 years now. Mrs. Cushman passed away last February. She will be remembered by her students for the kindness, patience, and joy she brought to the classroom. She also let us get to know her outside of the classroom. Each summer, Mrs. Cushman hosted a beach/pool party at her home in Fernandina Beach, FL. I think the photo above is from 6th grade (my mom dug it out of an album). 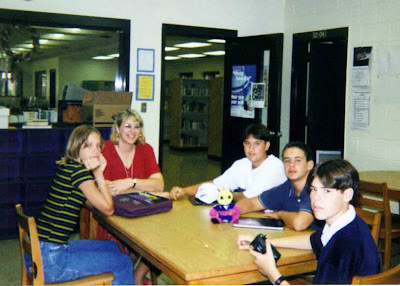 Since she worked in the gifted program and taught only a small number of students in this program all the way through middle and high school, we came to think of her as much a friend and mentor as a teacher. She is missed by many. I always think of her when I make this dish. Pan-fry the sausage to a nice brown. The sausage can be slightly under-cooked since it will cook again in the oven. Drain the fat from the sausage and then empty the pan onto a plate with a few paper-towels. The paper-towels will soak up more of the grease. 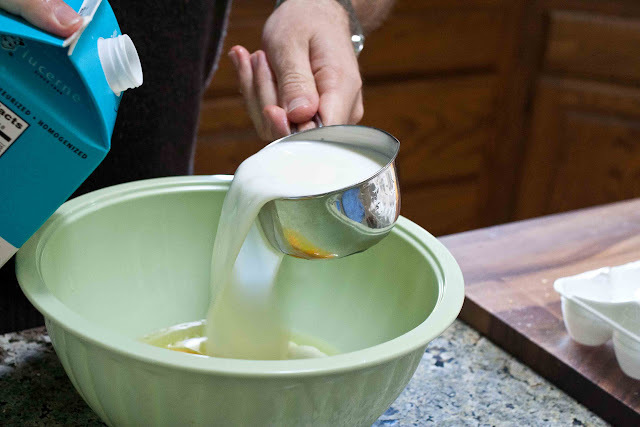 Add the eggs, milk, and dry mustard to a mixing bowl. Add a pinch of salt and pepper. Beat/whisk well like scrambled eggs. 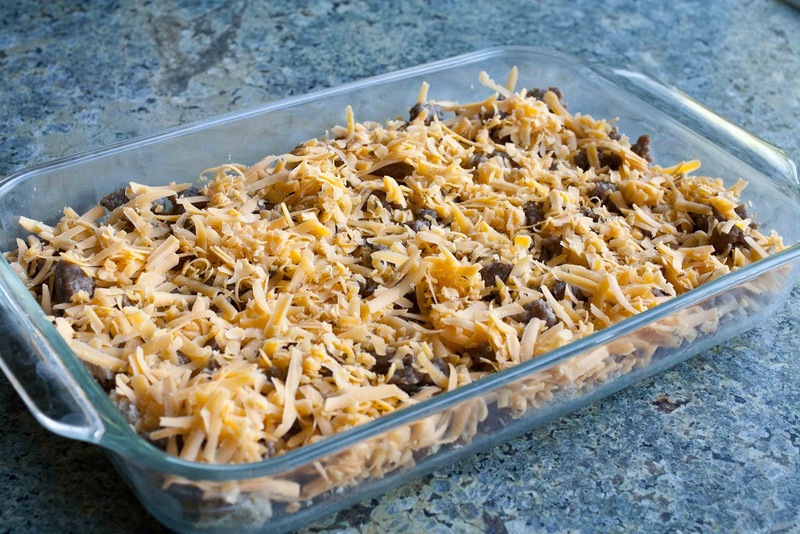 Take the crumbled sausage and spread evenly over the bread in the casserole dish. Sprinkle the cheese over the sausage. 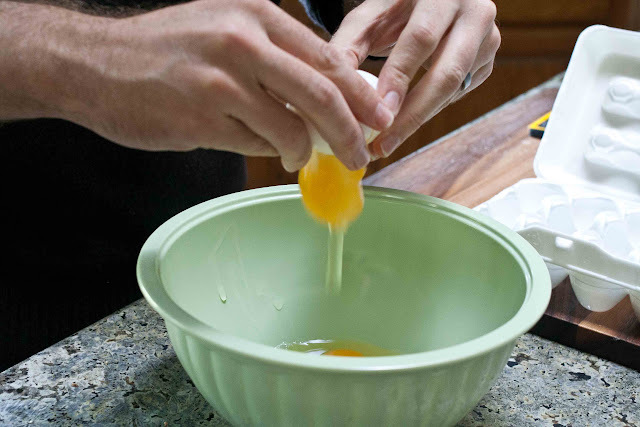 pour the egg mix evenly over the cheese and sausage. 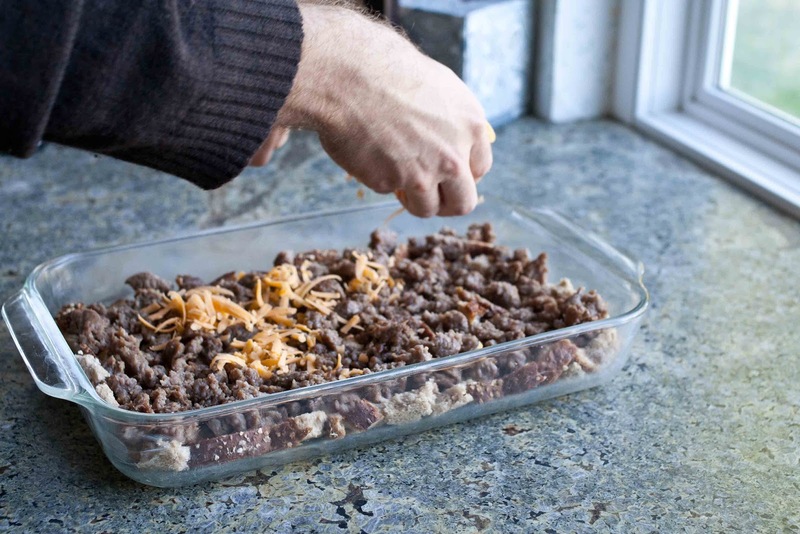 Cover the dish will plastic wrap or a lid and place in the fridge overnight. Happy New Year! 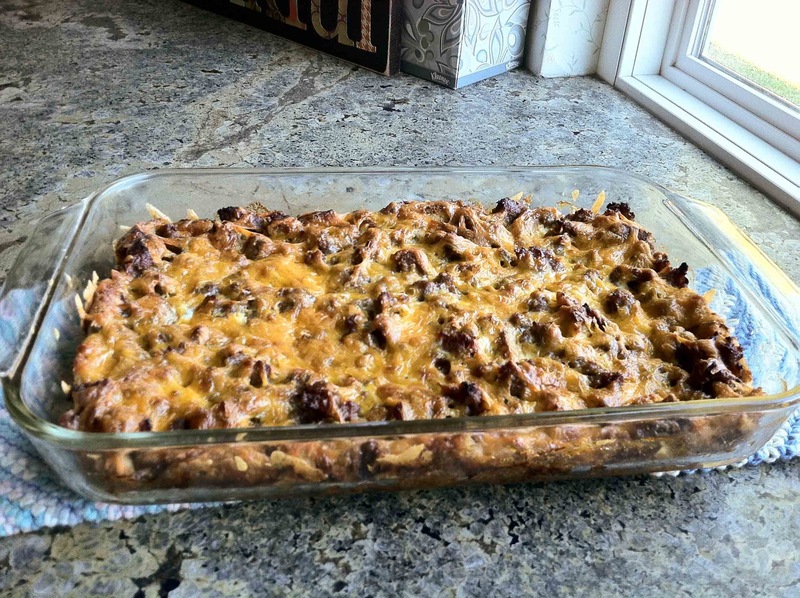 I love make ahead breakfast casseroles like this. YUM! I love stories about teachers who are excellent and inspiring! Three point shot for this caserole. Thanks! Colleen kept the tradition alive for Mitchell making it for the Spearrin household this year. Mrs. Cushman was one special teacher. Glad to have and enjoy her recipe each year. It's a must have dish in our family.